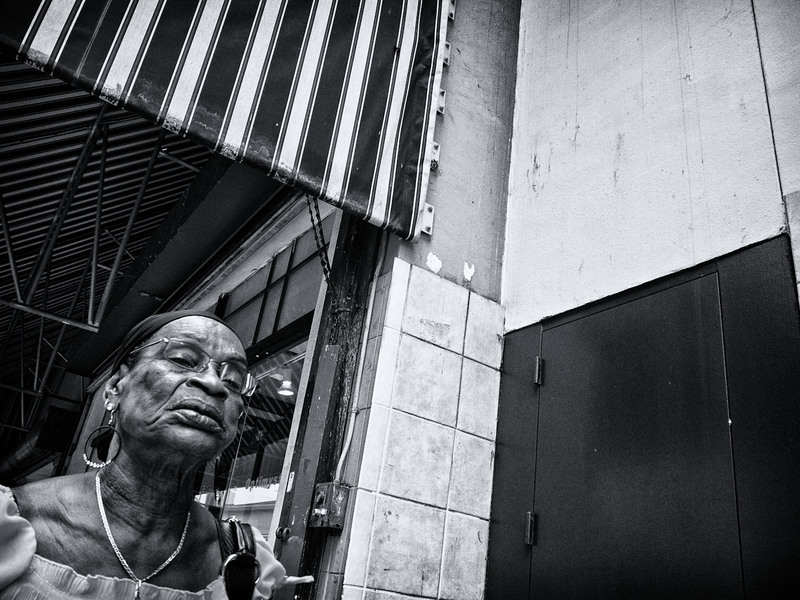 Continuing my series on Urban Portraits, I must really tell you all the story. Well, its not really a story but a brief anecdote. As I strolled thru the streets of Downtown I suddenly saw her and I knew it was a matter of maybe 10 seconds and our paths were going to cross for that split moment. I was ready though, my main street slugger so far, the ricoh was born ready(snap mode). She had a strong gaze and I knew I wanted it a unique “point of view” so I chose to go with the Daido style of shooting but this time, I adapted to this particular situation. I cross my hands, camera on the right hand, and I snapped the frame and just when I snapped, she told me to “Mama see you”. Lesson of the story. Sometime one tries to be a ninja but it doesn’t always work but photography often times doesn’t give another shot, its one shot, one kill type of mentality but more like one click, one frame, its just seconds at most. So have you guys been in a position which you tried to be on stealth mode but got picked off, but still got the shot or perhaps you missed it. I’d love to know share you anecdote in the comments. Great image, amazing detail in the portrait. A really striking face so worth going for. A nice choice of framing. yep she did ! nice shot still . . .
Grest street portrait – love her look down at you! All you guys, thanks a million for your solidarity and great insights and comments. Think I like the composition, adds a lot to the image. Better than missing the shot. Great face, shows perhaps how we become part of our environment. Again, what a great range of tones. Excellent shot. Like the expression and the lines. The black and white stripes of the canopy look particularly nice. I’ve not been caught that way before but then again I only rarely raise the camera from my side. If I was stationary I would probably risk one or 2 shots in landscape format but I’m nearly always on the move.. The framing works very well, stretching the tension of the picture composition. Good catch, yes we try all approaches to our ‘art’ but I’ve learnt the viewfinder is there for a good reason. All the best. Mama has a great look………Wonderful. I was picked off here, big time…….. Image Gallery / B&W !!! What a marvelous face, and you know she sees you. Most of the time I just have the camera down by my side and take a chance. Got a couple of people shots in Egypt that way, but I suspect they knew. What a beautiful precious mama…Well done ! Really like the divisions of squares and rectangles on the right of the frame.